Hi everyone! I’m Anne Sutton from Bunny Hill Designs and I’m delighted to be a guest blogger for Michele! 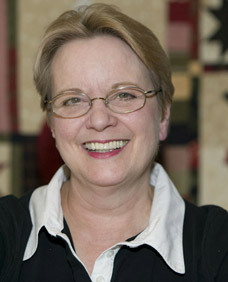 Thanks to her, we have a site where quilters can all connect. For those of you who don’t know me, my passion is appliqué and embroidery. I’m a quilt and fabric designer. I love hand work and you’ll usually find me with a thread and needle every chance I get. To think I have made a business out of my passion seems just too good to be true. Bunny Hill Designs started in a small 8′ x 10′ "extra" bedroom. I have to laugh because my friends would always say they were amazed that I could work in such a small space. Just put two people in that room, and you had a crowd. My design wall was a piece of flannel attached with Velcro to the top of the closet door! As my company has progressed so has my room! I now have a 600 square foot studio with work stations for two to three people. Fabric is continually rotated in and out of the studio depending what I’m working on. My stash now consists of "current" fabric and my whole life has changed. 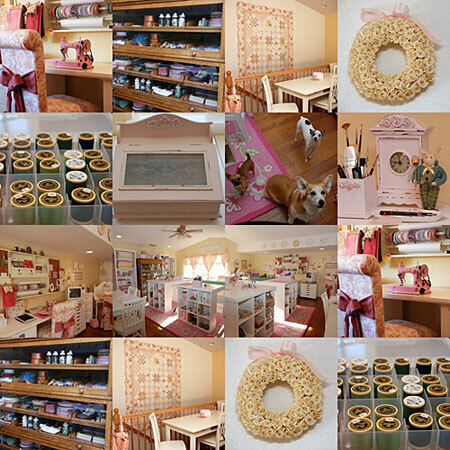 My patterns and inventory have a room of their own with shelves and a shipping station taking up most of the room. If you pick up the June 2009 upcoming issue of American Patchwork and Quilting (on stands in April), and you can see my home and studio. I’m the featured designer in that issue and they’ll have lots of pictures, along with a quick baby quilt I designed. I have so many fun things planned for 2009. I’m offering a free block of the month on my web site and you can download the pattern on the 5th of each month. Just go to Bunny Hill Designs and click on the "free pattern" tab. You’ll be on your way with some fun appliqué or redwork. I have lots of new patterns and fabric designs coming soon! Arriving this month to your local quilt shop is my very favorite fabric line, Chelsea Manor. For those of you who love embroidery this fabric’s for you! It’s the perfect colors of red/cream and brown/cream. If you’d like to keep up with my daily activities join me at Bunny Tales. I update my blog at least 3 to 4 times a week so you know what’s "happening" at Bunny Hill. The quilting world is a special place for friends, laughter and lots of fun! I’m so happy to be a part of it! I have been a fan of Ann’s for a while now and am doing her block of the month. Such a creative person ! It was really fun to see her work space and to hear that she has more surprises for us sewers in the future! Yay!! Hi, Anne! It’s fun to see you here at the Quilting Gallery. Your yellow studio inspired me to paint my sewing room yellow. My bedroom was yellow when I was a little girl. I wasn’t too sure about my sewing room being yellow, but when I saw yours I went to the paint store right away! I love yellow and pink together. I didn’t realize you, too, had pink in your studio. 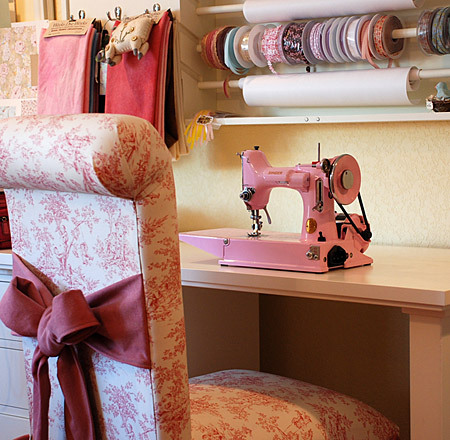 I love the pink sewing machine. I may have to paint mine pink! I love your work, love your patterns, love your blog, and love that you are such a giving person. Your free patterns, including the block of the month, are greatly appreciated. I first time visit in this blog. I feel this blog have relevant entry. Where can I purchase the three Ann Sutton patterns I want? Jelly Roses, Bitty Bunny and Bitty Dog. i love how many cute things you can make this way. my daughter’s room is full of things. Hola Anne te felicito por haber hecho esta empresa desde el comienzo en una pequeña habitación. Que lindas cosas tenes y sobre todo me gusta el patchwork.Comencé hace un año y estoy muy feliz de haber encontrado el patchwork hace un año y ya hice 3 edredones.Tengo que comenzar con los apliques que me encantan como quedan de lindos. Te felicito y que Dios te bendiga.